I can’t believe May is already over. 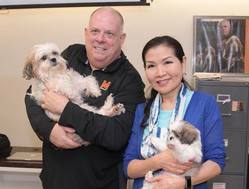 It has been a busy month – from signing over 400 bills into law to hosting our Howard County Cabinet Meeting to adding three new members to the Hogan family! During the past month, we signed legislation into law that will put money back in the pockets of hardworking taxpayers and help us create even more good jobs for Marylanders. We also signed major education initiatives that improve STEM access and career development programs. Before Memorial Day Weekend, we eliminated the $7.50 E-ZPass transponder fee, continuing our commitment to cutting tolls for all citizens. We are putting an additional $46 million back into the pockets of hardworking middle class families, retirees, and small businesses – and back into our growing economy. And, following the devastating severe weather and floods, our administration has implemented a coordinated statewide effort to keep Marylanders safe and informed. We are working closely with local officials to help those impacted recover as quickly as possible. 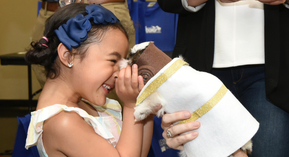 Read about these actions and more below. 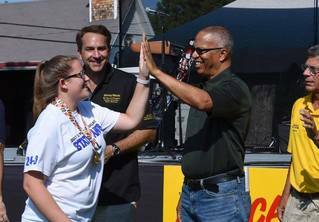 As we head into the summer months, I am looking forward to enjoying all that Maryland has to offer, from the mountains of Western Maryland to the beaches of the Eastern Shore! 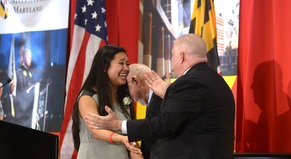 Be sure to stay up to date on what’s going on by following my Facebook page, Twitter, new Instagram account, and Snapchat (username: LarryHogan). Governor Larry Hogan directed Maryland state agencies to coordinate and work together to keep Marylanders safe and informed following severe weather, which included extensive and persistent rain, major flooding, and power outages in multiple locations throughout the state. 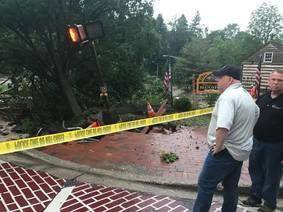 Ellicott City in Howard County was particularly devastated by this weather event, which also included significant flooding in Southwest Baltimore County, Baltimore City, and Annapolis. Governor Hogan declared a statewide State of Emergency on Sunday, May 27, which enables the state to efficiently coordinate support and provide additional assistance to all local jurisdictions that experienced flooding conditions. Click here to read more about actions and operations are being undertaken by state agencies to respond to the storm and resources for those affected by the flooding and severe weather conditions. 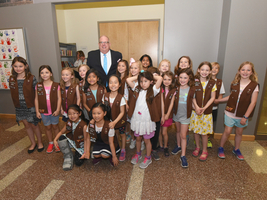 On May 12th, Governor Larry Hogan hosteda cabinet meeting in Howard County at the Charles E. Miller Branch Library and Historical Center in Ellicott City, Md. The governor was joined by Lt. 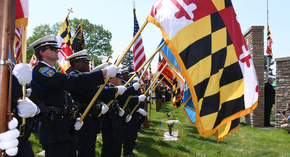 Governor and county resident Boyd Rutherford, who served as emcee for the meeting, as well as Howard County Executive Allan Kittleman, dozens of Maryland cabinet secretaries and directors representing agencies across the state, and state and local officials. This day of meetings and visits brought together elected officials, senior county leadership, local business owners, and public service personnel to discuss county specific issues and ensure direct engagement and communication with Howard County constituents. The Governor, Lt. Governor, and the cabinet secretaries and directors made over 100 stops. 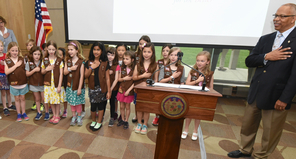 The governor visited the Double T Diner in Ellicott City, walked Main Street in Ellicott City, and much more. 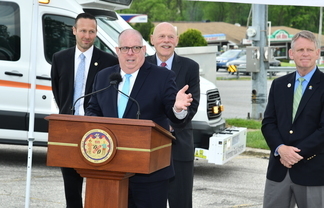 Governor Larry Hogan announced that the Maryland Transportation Authority (MDTA) will permanently eliminate the $7.50 E-ZPass Maryland transponder fee for all new customers, putting $46 million back into Marylanders’ wallets over the next five years. In 2015, the governor announced major toll rollbacks across the state, resulting in $270 million in savings for our citizens. 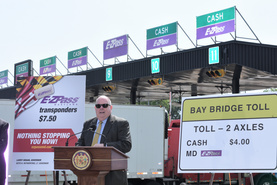 Free transponders eliminate $6 million in fees and provide new E-ZPass Maryland customers $40 million in toll discounts over the next five years. Customers using E-ZPass Maryland save 25 percent or more on Maryland tolls. At the Bay Bridge, the savings increases to 37.5 percent, or $2.50 for an E-ZPass customer versus $4.00 using cash. 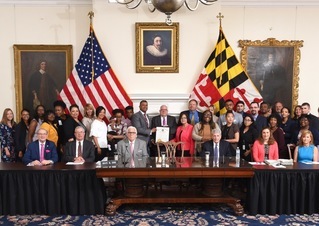 Governor Larry Hogan signed legislation proposed by the administration to support foster youth throughout Maryland at a signing ceremony at the State House in Annapolis. The Fostering Employment Act of 2018 provides additional resources to help foster youth and homeless youth pursue career opportunities and achieve success. 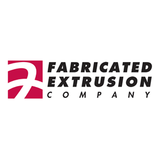 Fabricated Extrusion Company, a provider of custom extrusion manufacturing services throughout the United States, is establishing its East Coast presence by opening a headquarters and manufacturing facility in Hagerstown. The company, which has roots to the inventor of PVC more than 60 years ago, plans to create 50 new full-time positions in Washington County by the end of 2022. Fabricated Extrusion Company (FEC) is among the first out-of-state companies to submit a notice of intent and enroll its project in the More Jobs for Marylanders program, which was the centerpiece of Governor Larry Hogan’s 2017 Maryland Jobs Initiative, incentivizing manufacturers to create new jobs in the state. Did you know that Maryland is famous for its island ponies? Chincoteagues are ponies who live on Assateague Island. Some say that these ponies arrived after a Spanish ship crashed off the coast, but no one knows for sure. When you visit Assateague Island, you will find these ponies roaming freely! 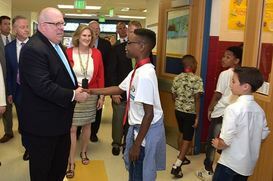 Following the Hogan administration’s Cabinet Meeting in Howard County, Governor Larry Hogan announcedthe start of a US 40 resurfacing project in Ellicott City, Md. that marks the halfway point of resurfacing or treating all state highway lane miles since 2015. This milestone marks the improvement of nearly 8,500 lane miles.